Daughter, thy faith hath made thee whole; go in peace, and be whole of the plague. 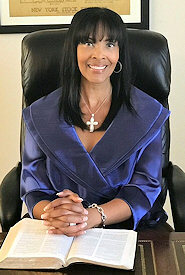 "The Lord Healed Me After 21 Years of Sickness and 7 Incurable Diseases"
Just Walk Ministry is a God-ordained ministry which started May 10, 2006 by Evangelist Karen D. Spencer. While she was very ill, God told her that He would heal her and then use Evangelist Spencer to Glorify His Name. Just Walk Ministry is one of faith and holiness and is taught wherever Evangelist Spencer travels. God gave Evangelist Spencer the gift of healing. God uses her as a vessel to heal many people of diseases and afflictions. It is her vision for Just Walk Ministry to reach people throughout the world and share with them her testimony of how Jesus healed her. People need their faith restored as well as encouraged. They need to know that God is the same God yesterday, today, and forever. Evangelist Spencer believes that having had to endure great pain and suffering for twenty-one years makes her an expert in teaching trust, faith, obedience, and patience while waiting on God to fulfill His promise. She had to fight, conquer and defeat all doubt, double mindness, wavering faith, and fear. She has seen the vision of what God has planned for Just Walk Ministry and she knows in God’s own perfect time He shall and will bring everything to pass.